Food and beverage cartons are one of the most sustainable packages available. They are made mainly from paper, a renewable resource from well-managed forests. As a lightweight packages option, cartons have a low carbon footprint as well as a low package-to-product ratio at 93 percent product and just 7 percent packaging. Shelf-stable (or aseptic) – are comprised of 74 percent paper, 22 percent plastic (polyethylene) and 4 percent aluminum. They are found on grocery store shelves and are used for soups, water, milk, juice, beans, wine and nutritional shakes. Refrigerated (or gable top) – contain approximately 80 percent paper and 20 percent polyethylene. They are found in the chilled section of the grocery store and are used to package milk, juice, cream and other beverages. Like any other material, cartons are sorted and baled at sorting facilities and then shipped to recyclers. 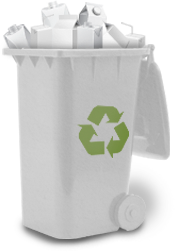 Cartons are recycled in one of two possible ways. At paper mills, the fiber is extracted and separated in a machine called a hydrapulper, which resembles a giant kitchen blender. The pulp that comes out is used to make paper products. This separation process is simulated in this video. Cartons go on to create everyday products such as paper towels, tissues, toilet paper and office and other writing paper. Another type of recycler uses whole cartons to make environmentally friendly building materials such as interior wall boards, roof cover board, ceiling tiles, exterior sheathing and floor underlayment.You can check out this video from our friends at Dem-Con Companies to learn more about the carton recycling process. 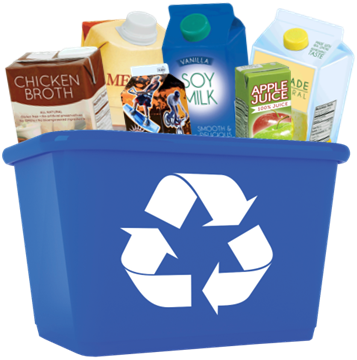 Cartons are a sustainable packaging option, but their lifecycle ends if they end up in a landfill. That's why it's important to spread the message that they can, and should, be recycled. The Carton Council is composed of four leading carton manufacturers, Elopak, SIG Combibloc, Evergreen Packaging and Tetra Pak. Formed in 2009, the Carton Council works to deliver long-term collaborative solutions in order to divert valuable cartons from the landfill. Through a united effort, the Carton Council is committed to building a sustainable infrastructure for carton recycling nationwide and works toward their continual goal of adding access and growing recycling of cartons throughout the U.S.